Snuggly fit the slices of pancetta into the wells of a mini-muffin pan. 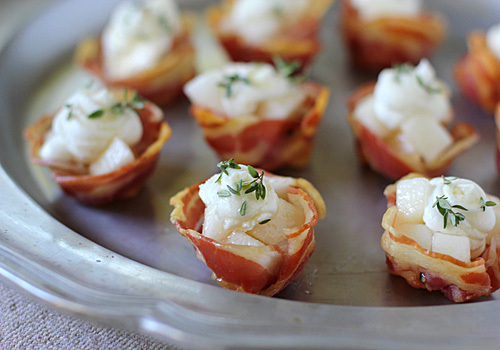 To help keep their shape while baking, ball up a small piece of aluminum foil and place into a pancetta cup. Repeat with the remaining cups. Place the pan into a cold oven and close the door. Turn the oven to 400º F and bake for 15-20 minutes or until the pancetta is browned and crisp. Carefully remove the cups, discarding the foil ball, and place them on a paper towel-lined rack to cool. The cups will continue to crisp as they cool. Meanwhile, toss the pears with the lemon juice in a medium bowl; set aside. In a separate bowl, stir together the goat cheese and half-and-half. Transfer the pancetta cups to a serving plate. FIll each cup with a spoonful of pears. Pipe using a piping bag or place dollops of the cheese mixture onto the pears. Sprinkle with the thyme leaves and drizzle with honey. Serve immediately. Enjoy! Sounds wonderful!! Wish we were there! I am drooling over these yummy delights! What a wonderful combination of flavors and a lovely presentation! I do hope you give it a try! It is a perfect balance of flavors and textures ranging sweet and salty to crisp and creamy. I have seen small cups made out of parm but not pancetta. What a cute idea and o the possibilities that you can fill it with--salad, figs, cheese, & more! Thanks for sharing. I would love to make these for my next party! Can the pancetta cups be made in advance and how long do you think the pear mixture would stay ie could I make it earlier in the day and assemble right before the party? Thank you! I can't say for sure, but you could make the "cups" a few hours prior to your guests arriving and the pear mixture up to an hour. The lemon juice will help keep the pears from oxidizing. The goat cheese and half-and-half can also be kept at room temperature for up to an hour. They come together rather quickly. Enjoy!